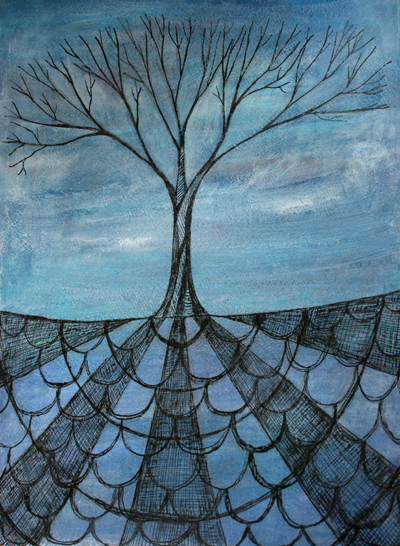 Here's what the layers painting became, a tree of life, drawn with ink over the layers of paint. Last night the hubster and I watched an installment of Through the Wormhole, a program on the Science Channel, narrated by Morgan Freeman. The program was all about how life began on earth and it was fascinating. Life is truly miraculous. In the program, they talked about the tree of life and how all living things on earth are connected. After awhile, it all starts to blow your mind! Leah, do you plan to make prints from it ? I love it. You know, Trees -and the one symbolizing The Tree Of Life even more- really “speak” to me. I love what your layers became. Wow ! Leah, the movement in the sky makes if feel like I can see the earth’s rotation. Lovely design and that blue! Oh I love this! Very cool and you know the portion on the bottom is almost like upside down roof tiles which would symbolize home. Probably going too deep there just thought I would mention it! I like how the rays become the twisting bark. I also like the way the sky interacts with the tree. Beautiful! Very pretty spreading tree & roots. That TV program sounds totally fascinating! Beautiful image–I love the roots–they really call to me. The sky is so lovely. You are an inspiration! I love what your layers painting has become. I think that the tree beautifully symbolizes the growth and rebirth of life. I also love the pen and ink work on this one. Very unique! REally lovely, Leah…so inspiring! Thank you for the link to Discovery Channel. I am always drawn to your paintings with primarily blue tones. There is just something about the colors in them that calls to me. I love the way the roots are rays that reach through the ground for connections while the branches reach out above ground. Everything is linked. I have been loving the beach at sunrise..I love those fairy pink flowers!